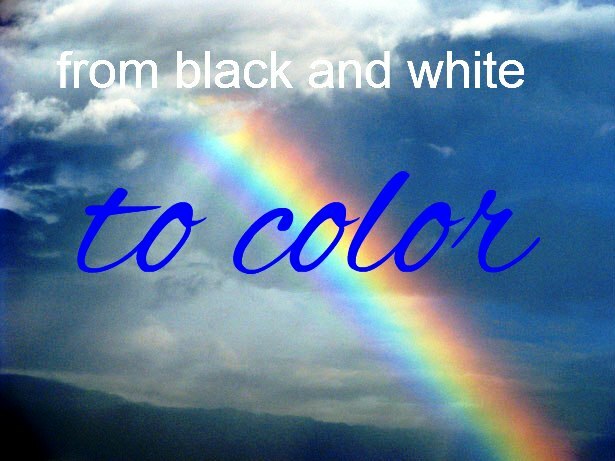 Many of us have seen the classic movie the wizard of oz, and how exciting it was to see the black and white film all of a sudden turn to brilliant color! Our lives are in a way the same as scripture teaches us we are only passing through this temporary life known as written in Psalm 23 as “The valley of the shadow of death”. As christians we know we are dead and our life is hid in Christ. He is our life while we live and after will spend eternity with Him (Colossians 3:1-4). If ye then be risen with Christ, seek those things which are above, where Christ sitteth on the right hand of God.2 Set your affection on things above, not on things on the earth.3 For ye are dead, and your life is hid with Christ in God.4 When Christ, who is our life, shall appear, then shall ye also appear with him in glory. The darkness of this life will of passed and behold only a life of no more pain nor tears awaits us! An eternal home more beautiful than we could of ever imagined or encountered while we lived (Revelation 22:1-7). And he shewed me a pure river of water of life, clear as crystal, proceeding out of the throne of God and of the Lamb.2 In the midst of the street of it, and on either side of the river, was there the tree of life, which bare twelve manner of fruits, and yielded her fruit every month: and the leaves of the tree were for the healing of the nations.3 And there shall be no more curse: but the throne of God and of the Lamb shall be in it; and his servants shall serve him:4 And they shall see his face; and his name shall be in their foreheads.5 And there shall be no night there; and they need no candle, neither light of the sun; for the Lord God giveth them light: and they shall reign for ever and ever.6 And he said unto me, These sayings are faithful and true: and the Lord God of the holy prophets sent his angel to shew unto his servants the things which must shortly be done.7 Behold, I come quickly: blessed is he that keepeth the sayings of the prophecy of this book.